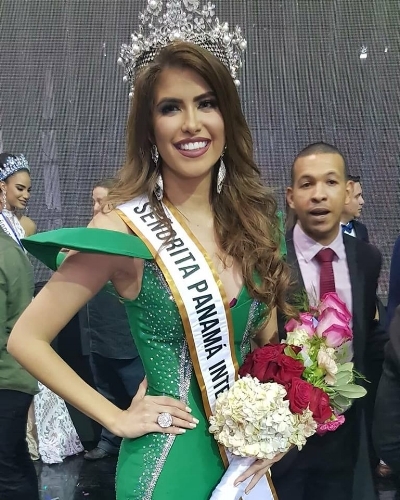 Rosa Iveth Montezuma (25) was crowned Señorita Panamá 2018 during the conclusion of the 51st edition of the competition held at the Roberto Durán Arena in Panama City on June 7th. With 1.68 m in height, Rosa has a degree in Food Technology and is currently pursuing a major in Informative Education. She will now compete in the Miss Universe 2018 pageant expected to take place in December. It is the first time that Panama is represented by a young woman of indigenous origin. Crowned Señorita Panamá Mundo 2018 is 19-year old Solaris Barba, a professional dancer in her 2nd year of Marketing and Business Administration. The 1.75 m beauty will travel to Sanya, China, to take part in the 68th Miss World competition to be held December 8th. Shirel Ortiz (23, 1.73 m) was crowned Señorita Panamá International 2018 and will represent the country in the Miss International 2018 event in Tokyo, November 9th. Completing the Top 6 were Diana Lemus who will compete in Miss Earth; 1st runner-up Zunilda del Valle, and 2nd runner-up Andrea Valeria Batista. Karla Rivas, Nohelys Gonzalez, Kiara Sang and Selena Gomez completed the Top 10 semi-finalists. From this field, the representatives to Reina Hispanoamericana, Miss United Continents and Reina Internacional del Cafe will be chosen. GB Opinion: We love the winner's story and what a breakthrough for her community. A strong group for Panama. Congratulations to all winners and finalists!